Technology has infiltrated all forms of business and daily life (Hello, Alexa), so it’s no surprise that the agricultural industry is also embracing the digital age, incorporating cutting-edge tech that’s more Silicon Valley than strawberry fields. Farming has traditionally sought to plow the field of volume: driving the biggest yields possible. Yet, while bigger might seem better, it hasn’t always been the most practical or indeed efficient method of farming. Food produced locally reduces waste and returns agriculture back to its roots: smaller scale produce that’s grown to local demand. Now we might be about to return to tradition by utilizing technology that tips agriculture into the realms of science fiction. Automated production is nothing new to the food industry. It’s been an essential staple of mass production for decades. Now automation has spread to the fields. Today, robotic fruit harvesters recognize which part of the produce to pick to best preserve the plant, future-proofing crops and minimizing waste. The technology also utilizes software to track and report crop data straight to an app on the farmer’s smartphone. Then there’s the use of drones to identify and spot-eliminate pests, rather than blanket-spraying crops with pesticides. Sound futuristic? It’s already in place for farms that have found themselves short of manual labor. Who says you even need fields? With companies such as Freight Farms, the growth of produce has shifted from the rural to the urban. 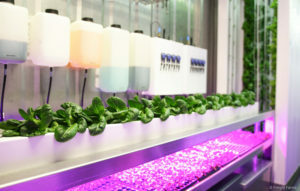 Leafy Green Machine is an automated hydroponic farm that fits inside a shipping container. These space-friendly industrial greenhouses are a mobile answer to the perennial problem of uncontrollable weather. No longer at the mercy of mother mature, crops can grow absolutely anywhere. Oh and did we mention that the Leafy Green Machine was created using SOLIDWORKS? Utilizing 3D CAD, the team were able to test designs with laser-sharp accuracy, making essential modifications without the need to produce expensive physical prototypes. Of course, environmental conditions are a crucial factor in successful farming. Adverse weather can ruin a crop before it’s even had a chance. Claydon Drills know all too well, after setting themselves the challenge of establishing crops in all manner of weather conditions. From the near impenetrable frozen grounds of -20℃ to the arid scorch of 50℃, Claydon Drills created a seed-sowing machine that plants like no other before it, at five times the pace. It’s a breakthrough that again arms local producers with the power of productivity. Need we mention that SOLIDWORKS was instrumental in the seed drill design process? These advances are agriculture’s progressive response to food waste. It’s about eschewing mass farming methods in favor of home grown produce to meet the local demand. With a rising global population and scarce resources, tech-driven farming is presenting ideas worth harvesting. Wondering how SOLIDWORKS can help your team design for the future of your industry? Click here and an expert from The SolidExperts will be happy to help.